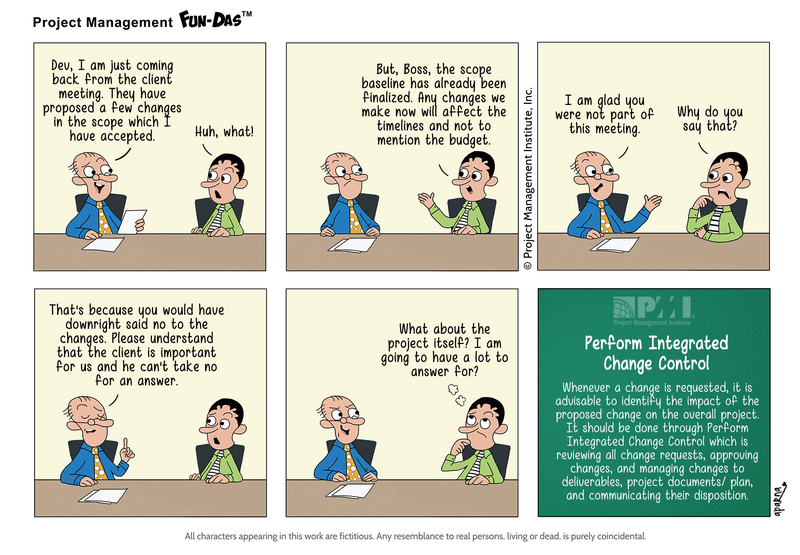 1 Search Results for "#Perform Integrated Change Control"
Boss: Dev I am just coming back from the client meeting. They have proposed a few changes in the scope which have accepted. Dev: But, Boss, the scope baseline has already been finalized, any changes we make now will affect the timelines and not to mention the budget. Boss: I am glad you were not part of this meeting. Dev: Why do you say that? Boss: That's because you would have downright said no to the changes. please understand that the client is important for us and he can't take no for an answer. Dev (thinking): What about the project itself? I am going to have a lot to answer for? Whenever a change is requested, it is advisable to identify the impact of the proposed change on the overall project. It should be done through perform Integrated Change Control which is reviewing all change requests, approving changes, and managing changes to deliverables, project documents/plan, and communication their disposition.